OK...last night I took the hanging trellis off of the tray feeder and layed it on the ground. I am not sure what I am going to do with the clemantis....I thought no more chipmunks clearing the tray feeder...there will be some safflower left on it for the cardinal and peanuts for the blue jays...WRONG! Now what? How much can I trim off of the tree ? 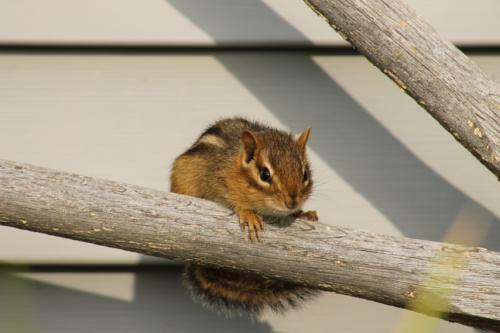 Thinking, thinking and thinking but these little chipmunks are smart....The question is "Am I Smarter Than a Chipmunk?" The reason I have the feeder so close to the lilac tree and the window was so I could take pictures of the cardinals, blue jays and squirrels and yes the chipmunks...I just might have to find another close location that I can move it to or just take it down until winter when the chipmunks hibernate...Most likely it will have to be taken down....the little creatures have won...I even tried spraying the pole with Pam , thinking they were climbing the pole. I'd really love to see these guys in action some day. Confronted with a problem they seem to be very smart and industrious. But of course annoying for everyone else! Cute little bugger.They are very smart. They are so determined they wear us down. Earlier in the spring we trapped 8 chipmuns and 7 squirrels and relocated them. It didn't seem to make a difference, another one just takes its place. I had 4 squirrels and 3 chipmunks scurring around at the same time. I have greased the pole, moved it to the middle of the rosebush...it doesn't seem to matter. Now I have it where they do the least damage to the garden. The other day I took the feeder off the pole after the chipmunk went back with his pouches full. He climbed the pole 3 times looking for the feeder before he finally left. We maybe smarter but the usually prevail. We have squirrels in our yard. And a 7 year old Chocolate Lab. I am not really sure who is the true tormentor in the yard. The squirrels run across the top of the fence while the dog chases them. They sit at the top of the fence, egging her on, almost teasing her to chase them. It is a comedy show in my own backyard! Yikes Sherry that is a good question. They can't get in any of my feeders. The one I have on a post I put metal venting pipe around. They crawl under it but can't get in the feeder. We have been having way to many of them in our yard. They have several holes in our back lawn and side yard. They tried to make homes along the front of the house. But I kept filling them in.They are cute, but I may have to trap and move these's little critters. One lady I happened to talk to at Fleet Farm trapped 35 of them in one season. YIKES!